With 18 million inhabitants, North Rhine-Westphalia is the most populated federal state in Germany. Alone 700,000 humans live in the state capital Dusseldorf. Excellent roads encourage visitors to rent a car before the visit. The federal state has to offer very different landscapes and attractive objects of interest, which can be reached comfortably with the rental car. 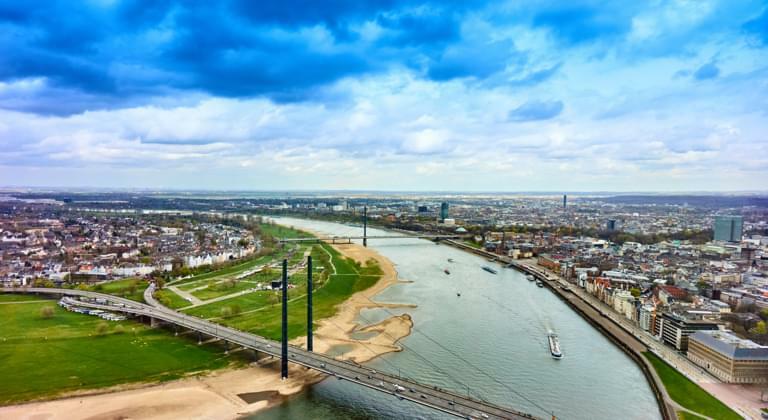 Dusseldorf fascinates countless visitors with its elegant shopping streets, sights and in the evening with the famous old town. Cologne in the south and Aachen in the west have similar attractions. In both cities there is to visit beside many historical objects of interest in each case an impressive cathedral, beyond that the metropolises are popular due to their international flair. You reach Cologne or Aachen with the rental car over optimally developed motorways within shortest time. If you are interested rather in the highlights of the present, use your rented car simply to a attendance of the Zeiss planetarium in Bochum. On the way you could still admire the suspension railway in Wuppertal and explore the customs union colliery in Essen. At which airports can I rent a car in NRW? In between the lively metropolises of the federal state of North Rhine-Westphalia you can see the extremely diverse nature, for which it is always worthwhile to rent a car cheaply. North of Dusseldorf you drive by rental car through seemingly endless plains, while in the east the hills of the Bergisches Land inspire you to excursions and hikes. In the southwest, the Eifel Nature Park awaits you with an excitingly beautiful landscape and a spacious bathing lake. Here you can ideally park your rental car and continue your exploration on foot.